It's been quite a two-year run for Jerome Messam. No CFL running back has been more prolific than the Brampton, Ont., native, who has rushed for 2,214 yards the past two seasons and helped lead the Calgary Stampeders to consecutive Grey Cup appearances. 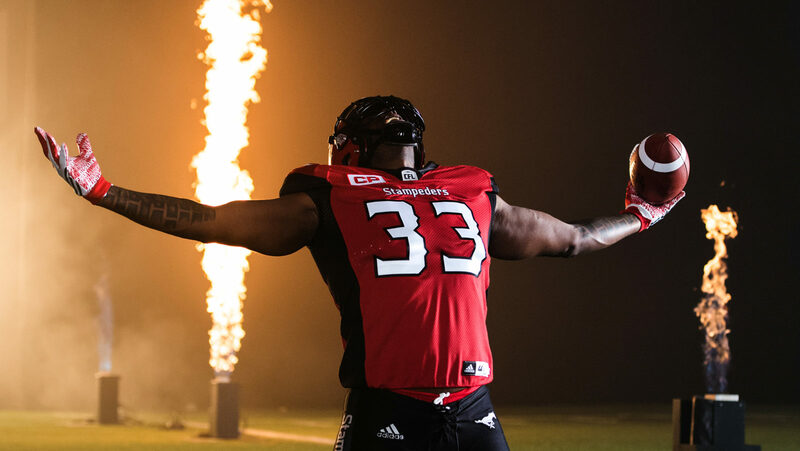 But the six-foot-three, 255-pound Messam is expected to be on the open market Tuesday when CFL free agency begins. On Thursday, Calgary president/GM John Hufnagel said the team advised Messam to test the free-agent waters although he didn't close the door on hard-running Messam's possible return. "We told Jerome that go into free agency, see what's out there and then call us if they'd like to,'' Hufnagel told reporters in Calgary. Veteran linebacker J.C. Sherritt won't be hitting the open market. The CFL's top defensive player in 2012 reportedly agreed to a one-year deal to return for an eighth season with the Edmonton Eskimos. But there's still plenty of other CFL veterans who could join Messam in free agency, including: American linebackers Taylor Reed (Ottawa) and Larry Dean (Hamilton); Canadian defensive backs Matt Black and Jermaine Gabriel (both Toronto) as well as American defenders T.J. Heath (Winnipeg), Ronnie Yell (B.C. ), Tommie Campbell and Joe Burnett (both Calgary); Canadian receiver Nic Demski (Saskatchewan); Canadian defensive lineman Ted Laurent (Hamilton); American receivers Luke Tasker (Hamilton) and DaVaris Daniels (Calgary); and American running back/kick-returner Roy Finch (Calgary). Age is certainly a consideration as Messam will be 33 once training camp begins and no other CFL running back has more carries the past two years than Messam (421). But Messam has been a durable performer, missing just one regular-season game over that span. And there's certainly no doubt regarding his productivity. Messam ran for a CFL- and career-best 1,198 yards in 2016 before registering 1,016 yards rushing last season and has averaged 4.72- yards per carry overall. Messam has also scored 20 rushing TDs, tops among CFL players, over the last two years. He's also registered 87 catches for 668 yards and a touchdown. Messam captured the league's outstanding Canadian award in 2016 (for the second time) before being named the top Canuck in last year's Grey Cup, scoring two TDs in Calgary's 27-24 loss to the Toronto Argonauts. But for the Stampeders, economics certainly come into play. They could play a younger (and less expensive) American at running back and start another Canadian elsewhere for less than the six-figure stipend Messam commands. CFL teams must start at least seven Canadians each game and GMs wrestle with where to allocate that money in their lineup. Interstingly, the Stampeders have employed a Canadian starting running back since 2012 when Jon Cornish of New Westminster, B.C., secured the job. Calgary acquired Messam from the Saskatchewan Roughriders late in the 2015 campaign. Messam became the starter when Cornish retired after the season ended. The Stampeders will have a hole to fill on their offensive line after veteran tackle Dan Federkeil, 34, of Medicine Hat, Alta., retired Thursday. Barring a last-minute deal with Calgary, Messam would be an interesting commodity on the open market. The Grey Cup-champion Toronto Argonauts would appear to be in the market for a running back with sophomore James Wilder Jr. having vowed to out the season after the club refused to let him out of his CFL deal to pursue NFL opportunities. Veteran Brandon Whitaker is also a pending free agent. What's more, Messam and Argos GM Jim Popp have a history. Popp was Montreal's general manager when the Alouettes acquired Messam from the Edmonton Eskimos on Feb. 5, 2013. Messam appeared in 15 games with Montreal, starting nine. He ran for 565 yards on 121 carries (4.7-yard average) before being released prior to the '14 season.